Dixieland Mom Product reviews, along with Rewardit Sweepstakes and our co-hosts, My Vegan Gluten Free Life, Zoes Printable Coupons, Hot Beauty Health, Giveaway Bandit, and Freebie Spot are excited to bring you the HP Pavilion Giveaway Event! 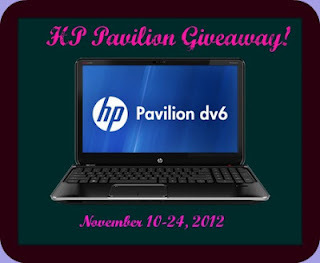 One very lucky reader will win a HP Pavilion Dv6t-7000 Quad Edition Notebook PC with a MSRP of $1149.00!! Entry is simple, just follow the directions on the Rafflecopter below! For extra entries, sign up for Rewardit! You could even win a $1000! Rewardit rewards you for doing things you already do online anyway! You can earn money while shopping, playing games, watching videos, and using coupons! They also have the Rewardit Cash Sweepstakes, so you have a chance to win even more money! Sign up today and you will earn 25 extra entries in the HP Giveaway! Disclosure: I received no compensation for this publication. My opinions are my own and may differ from those of your own. Hot Beauty Health is not responsible for sponsor prize shipment. HP is a great brand and I know their computers are built to last. I’d love to have one! I’d like to win because I don’t own one myself. Hubby and I have to share one. I’d like to win because I’ve never had a nice, brand new laptop. I have a crappy notebook right now and if I won this, I’d give it away! I’d be much happier with this Hp Pavilion. I am on my laptop a lot and it’s old and has already been upgraded and I really need a newer more up to date laptop. My son needs one for the accelerated middle school he will be attending next year and there is no way I can afford one. I would love to win this for my husband he doesnt ask for much and this would be just what he needs! I would love to win because my desktop crashed and I have to bring my work computer home everyday and I am afraid that something will happen to it. I’d so love to have my own. My laptop has missing letters…they broke off 🙁 I also have 4 children that use the laptop and I need a new one so there’s less fighting. if you would of asked me this an hour ago my response would of been different but my pup (marley) dumped my laptop on the floor and the screen is cracked now 🙁 so this is why I need a new laptop. Thanks for the opportunity. I would love to win this computer. So that I can save my embroidery and quilting patterns. That way I do not have to listen to my husband complain all of the time about using his. It would help with work assignments. I need a faster computer and this one is perfect! Mine is so old and slow – would love a new one. computers how would we get along without them. I would love to be able to give my son this laptop for Christmas! His current laptop is many years old.